Rain or shine, Northland sheds are a wonderful place to keep your outdoor equipment and tools protected from the elements. These sheds have built in floors, water-resistant siding and shingles, and locking doors. However, they can also be attractive places for pests to seek shelter from the weather too. Depending on where you live, you may have to contend with a variety of insects and small animals trying to get into your shed. Sometimes, mice and rabbits will come indoors to stay warm in winter or in the spring to make a nest for their babies. The wood is also a tempting food source for termites. Thankfully, these sheds are made like a traditional home with well-sealed holes and few drafts. The siding is also somewhat pest repellent and will help keep insects from boring into your building. However, the most dedicated of pests can still find their way in. Your attention to detail and a tidy space are essential to keeping your shed free from invasion. Even if you don’t use the building very often, make a point of checking it out once a month or so. This will allow you to see if any animals have been chewing at the siding or doors, and if anyone has taken up residence inside. While you do this, you might want to spray an insecticide around the exterior perimeter and interior the building. An insecticide like permethrin, has a half-life of at least 20 days, according to The National Pesticide Information Center. So, it’s good to reapply monthly. Of course, the half-life of insecticides can vary a lot and can also be affected by the surface they are applied to. Double-check the instructions to get a better idea of a product’s longevity before you buy. Insects, like spiders, love setting up homes in dark corners and hiding spots. They can hide out in boxes too. Make sure to use sealable containers, such as plastic totes for storage. Cardboard boxes are easy to get into and degrade quickly. If you use your shed for storing a lot of items, you might want to do a regular clean out twice a year. Once in the spring and once in the fall. This will catch pests during the times when they are most likely to look for a warm home. While the exterior of your shed may be vinyl siding or else painted slats, the interior usually is not. Painting the exposed wood can provide an extra layer of protection against insects looking for meals. It also helps keep moisture from seeping into the wood, according to DoItYourself.com. Maintenance and vigilance during seasonal changes will help keep your investment from being inhabited by pests. 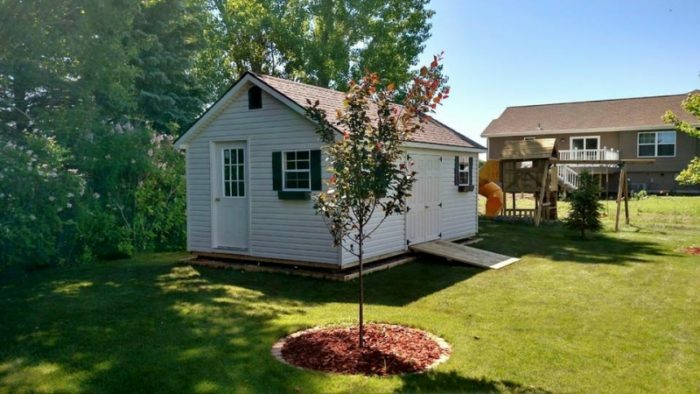 As the shed ages, it can also help you to stay on top of any damage or repair issues. Rotting wood, peeling paint, and even broken glass are small fixes when caught early, but can lead to big damage in the long run.